A dancer challenging perceptions about who can dance, a festival building new audiences in the disabled and Deaf communities, a partnership project providing creativity and connections for alienated youth, a creative space in Christchurch providing a pathway to mental health and wellbeing, and leadership in delivering arts programmes in prisons were recognised tonight at Te Putanga Toi Arts Access Awards 2018, presented in Parliament by Arts Access Aotearoa. Te Putanga Toi Arts Access Awards 2018 were hosted by Hon Carmel Sepuloni, Minister for Disability Issues, in the Banquet Hall of Parliament. 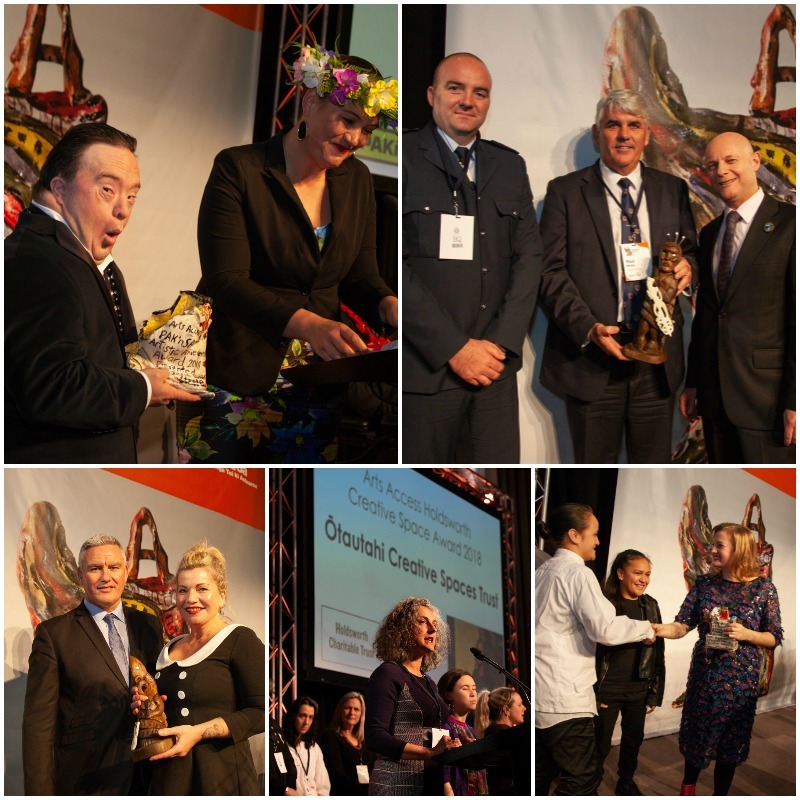 This year’s Arts Access Accolade was presented to Beth Hill, programme leader for arts, self-directed learning and living skills at Northland Regional Corrections Facility, by Arts Access Aotearoa Kaumatua Bill Kaua. It recognises Beth’s support for Arts Access Aotearoa’s work in providing access to the arts for prisoners. Unlike the other award recipients, selected by a judging panel, the Arts Access Accolade is chosen by Arts Access Aotearoa’s staff and board. Executive Director Richard Benge says that without Beth consistently pushing boundaries to ensure access to the arts at Northland Region Corrections Facility, Arts Access Aotearoa would not have developed its Arts in Corrections programme to the quality it is today. “Beth has been courageous in her collaborations with Arts Access Aotearoa and has taken many leaps of faith to make our projects succeed beyond what we thought was possible for the performing arts and for the provision of access to the arts in a prison environment,” he said. Ōtautahi Creative Spaces, Christchurch, awarded the Arts Access Holdsworth Creative Space Award 2018, for its focus on artists and their pathway to mental health and wellbeing; its innovative programmes and community partnerships; and its leadership in providing evidence-based research on its outcomes and value. Beth Hill, Northland, awarded the Arts Access Corrections Māui Tikitiki a Taranga Award 2018, for her leadership in the use of the arts and education as transformative tools for men in Northland Region Corrections Facility. Waitakere Alternative Education Consortium, Target Alternative Education Centre, Creative Collaborative, Auckland, awarded the Arts Access Te Auaha Community Partnership Award 2018, for an outstanding partnership project called Humans of Hendo in which young people used photography and storytelling to make meaningful connections with people in the Henderson community, following concerns about youth disengagement and violence in Henderson, including the murder of a dairy owner. Auckland Arts Festival, Auckland, awarded the Arts Access Creative New Zealand Arts For All Award 2018, for its leadership and commitment to making the festival accessible to diverse audiences and building new audiences for the arts. Jesse Johnstone-Steele, Auckland, awarded the Arts Access PAK’nSAVE Artistic Achievement Award 2018, for his outstanding artistic achievements and contributions, and his pivotal role in Touch Compass Dance Trust since its inception in 1997. Hawkes Bay Regional Prison and St John’s College, awarded the Arts Access Corrections Whai Tikanga Award 2018, for a partnership project between secondary school students and young prisoners that explored the young prisoners’ creative potential (making rimu platter boards) and developed a successful business model within a tikanga framework. Lynn Freeman, Radio New Zealand, Wellington, awarded the Arts Access Creative New Zealand Media Award for her commitment to reporting on the diverse arts and artists of New Zealand over nearly 20 years – most recently as a presenter on RNZ’s arts show, Standing Room Only. Richard Benge, Executive Director of Arts Access Aotearoa, said that one in four people in New Zealand – more than one million – live with a disability or impairment. Touch Compass, Auckland, Arts Access Holdsworth Creative Space Award 2018, for its pioneering role in integrated dance and challenging people’s perception of what dance is and who can do it. Raukatauri Music Therapy Centre, Auckland, Arts Access Holdsworth Creative Space Award 2018, for the impact of its music therapy programmes and outreach partnerships. Jade Morgan, Dunedin. Arts Access Corrections Māui Tikitiki a Taranga Award 2018, for his use of martial arts and tikanga at Otago Corrections Facility to inspire positive change, and for offering education opportunities to released prisoners at Otago Polytechnic where he works as a lecturer. George Massingham, Hawkes Bay, Arts Access Corrections Māui Tikitiki a Taranga Award 2018, for his leadership in enabling tikanga-based arts and cultural programmes to flourish at Hawkes Bay Regional Prison. Write Where You Are, NZ Festival, Rimutaka and Arohata Prisons, Wellington, Arts Access Community Partnership Award 2018, for a partnership that delivered a safe, valuable experience with many positive outcomes for all involved, in particular for the men and women in prison. Royal New Zealand Ballet, Wellington, Creative New Zealand Arts For All Award 2018, for its programme of accessible events making ballet accessible to people who might not otherwise get the chance to experience it. Suzanne Cowan, Auckland, Arts Access PAK’nSAVE Artistic Achievement Award 2018, for a professional dance career spanning 19 years as a dancer, choreographer, teacher and academic, becoming the first contemporary dancer with a disability in New Zealand to gain a PhD in dance. Jacob Dombroski, Wellington, Arts Access PAK’nSAVE Artistic Achievement Award 2018, for his talent and commitment to his craft, and wowing audiences with his solo work Big J Stylez. Bundy Waitai and Arrin Clark, Northland, Arts Access Corrections Whai Tikanga Awards 2018, for their cultural programmes at Northland Region Corrections Facility that empower prisoners to reconnect with their culture, gain a sense of identity and make positive change. You can read more about the individuals, groups, organisations, partners and projects. Original generation time 1.6518 seconds. Cache Loaded in: 0.0744 seconds.